Exercising on a regular basis is important. It does not only help you lose weight if you are overweight and help you maintain a healthy weight, but physical exercise also ensures that your body stays healthy. Choose My Plate recommends that adults between the ages of 18 to 64 years obtain around two and a half hours’ worth of moderate aerobic exercise on a weekly basis. They also recommend doing some strength training exercises on a minimum of two days every week. This combination will ensure you obtain an adequate amount of exercise to support your body. Adolescents and children between the ages of six and 17 years should participate in physical activities for at least 60 minutes a day to support their growth and overall health. Apart from its positive effect on weight control and keeping the body healthy, physical exercise has many other benefits for a person. Regularly participating in exercises and physical activities can reduce your risk of being diagnosed with a metabolic syndrome, type 2 diabetes, and cardiovascular disease. It can also improve your mood and support your mental health, as well as help you fight against some cancers. People with certain types of arthritis can also benefit from physical activity as it helps to strengthen the bones. While working out inside at the gym is an excellent way to get in some much-needed exercise in the winter months – it is often too cold to work out outdoors, which means a gym or even indoors at your home is the perfect place to obtain your required physical activity. During summer months, however, people often prefer to add some outdoor activities to help them gain some exercise with some fresh air to breathe in. 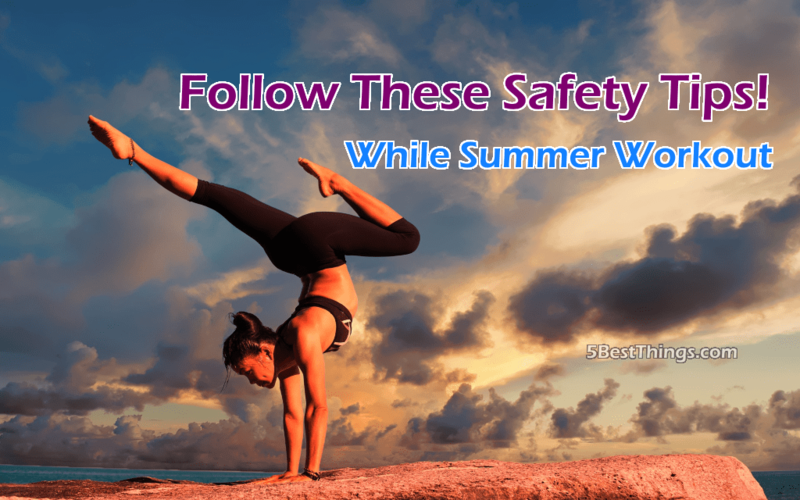 While summer may seem like the perfect time to move your exercise routines outside, you should note that there are some risks involved. In this post, we will be taking a look at how you can ensure you are safe while exercising outdoors during the warmer months of the year. Summer heat can have a significant impact on the body and increase the amount of stress that is placed upon the heart during exercise. While exercising, the heart works hard to deliver oxygen, as well as blood, to the muscles that are being trained. The heart also needs to deliver blood to your skin to maintain a lower internal temperature. Cleveland Clinic reports that your heartbeat increases by about 10bpm for every degree your internal temperature rises. To make sure you are not overdoing it, you should start out slow when you move your exercise routines to the outdoors. Reduce the intensity of your exercises and the duration during the first few days. As your body gets used to the heat, you can gradually start to increase the duration and intensity of your routines until you reach your normal level. About 500ml of cold water should be consumed approximately one hour before you start exercising. Another 500ml of cold water should be consumed about 15 minutes before your exercise routine. You can choose to drink a sports drink at this interval as well. You should keep about one liter of cold water with you while you exercise and consume around 150ml of this water at 10-minute intervals during your routine. After you have completed your exercise routine, consume another 500ml of cold water. While it may be tempting to do some workouts in the backyard when the sun is out, you should note that direct sun exposure can cause additional harm to you while you are working out and may even lead to a higher risk of getting heat stroke. To exercise outdoors when the sun is out, you should try to find a location where some shading is available and possibly perform all of the exercisings in the shade. You can also choose to do your workouts outside when the sun is not at its highest point – this would mean in the morning and late afternoon. Try to avoid doing any outside exercises between 11 AM and 3 PM. You should also apply sunscreen to your body and try to wear loose fitting clothes. Many brands also have UPF clothing, which means the clothes will provide additional protection from the sun. A hat and sunglasses can also help to keep direct sunlight out of your face. Knowing when you should stop your exercise routine even if there’s some time left is vital. This will help prevent serious symptoms, such as heat stroke, from occurring – which could be life-threatening in some cases. To realize when you should stop, you need to understand the different signs related to particular conditions that may have a negative impact on your body when you exercise in the heated environment. This is not a very serious condition, but can still hurt your physical performance and is also considered to be one of the first signs that you are pushing yourself too much in the heat. When muscle spasms and cramps occur, you should consume water to up your fluid level and also do some gentle stretches, combined with massaging. If you have heat cramps, you should stop exercising and only perform physical activity several hours after the symptoms go away. Heat exhaustion is a condition that causes dizziness, breathlessness, and severe fatigue. It is often also accompanied by vomiting, and you may also faint when you have heat exhaustion. This is also a serious sign that you should stop your exercise routine and rather continue later on when it is cooler. The condition often causes your skin to become clammy and cold, but it can also cause your skin to become very dry and warm to the touch. Heat exhaustion can also cause your blood pressure to drop. This is a more serious symptom that you may experience if you push your body too much while training outside when the sun is up. It is often a life-threatening symptom. Heatstroke causes your body’s temperate to rise over 104 degrees. You will also feel confused and disoriented, your breathing will become rapid, and you may experience skin flushing. If you experience heatstroke, it is vital that you seek medical attention immediately. Indoors is considered to be the best location for working out in winter, but outdoors is often the preferred location during summer months. Exercising outdoors during summer can be dangerous if you do not listen to your body, protect yourself from the sun, keep your body hydrated and know when to quit. People with certain conditions should be extra careful. Arthritis patients may also benefit from consuming a natural supplement like JointFlex to help keep their joints mobile while they work in the summer heat.